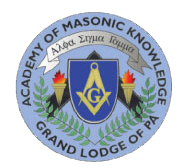 PENNSYLVANIA ACADEMY OF MASONIC KNOWLEDGE – SPRING SYMPOSIUM – Orrstown Lodge No. 262 F. & A. M.
The 2018 Spring Symposium of the Academy of Masonic Knowledge will be held on Saturday, March 17th, in the Deike Auditorium of the Masonic Cultural Center on the campus of the Masonic Villages in Elizabethtown, Pennsylvania.Registration will open at 8:30 AM with the program beginning at 9:30 AM.Â Pre-registration is required. To pre-register, please use the link provided atÂ pamasonicacademy.org orÂ email your name, Lodge number, and home zip-code to: AMKSecretary@pagrandlodge.org.Â If you do not have access to email or the internet, please ask your Lodge Secretary to register for you.